Although we found lots of beauty in the Maritime provinces and are glad we went there for several weeks, we are also glad to be back "home" in the States tonight. 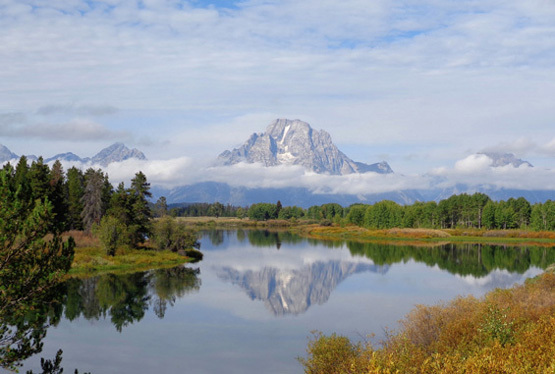 As full-time RVers one of my favorite sayings is that "home is where our camper is parked." For now, we don't want or need a stationary sticks-n-bricks abode of any type. We want the freedom to travel when and where our muses beckon us. This trip to Canada made me realize, however, that we do still have the need for a home country. We wouldn't want to travel outside the U.S. all of the time. Although Canada really isn't all that foreign to travelers from the U.S., it just never really felt like "home" to us despite living in our own rolling residence while we were there. If the weather had been better we might have persuaded ourselves to spend a couple more days in New Brunswick on our way back to Maine. But it was a soupy mess for most of today's route through southern Prince Edward Island and southeastern New Brunswick. 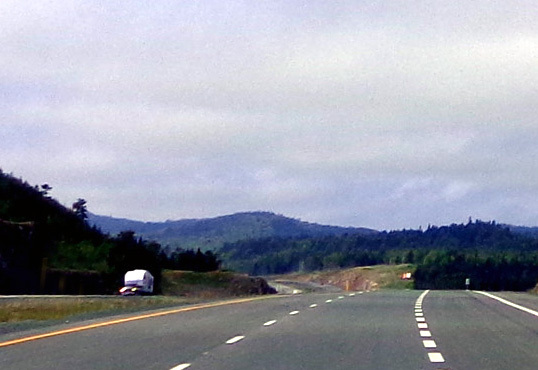 We made our way from the campground to Charlottetown, then followed PE 2 and CA 1 to the Confederation Bridge; CA 16 south to NB 15, which came into Moncton from the northwest; CA 2 through Moncton, then NB 1 south through St. John; south at exit 9 through St. Stephen, NB to the border crossing at Calais, ME. 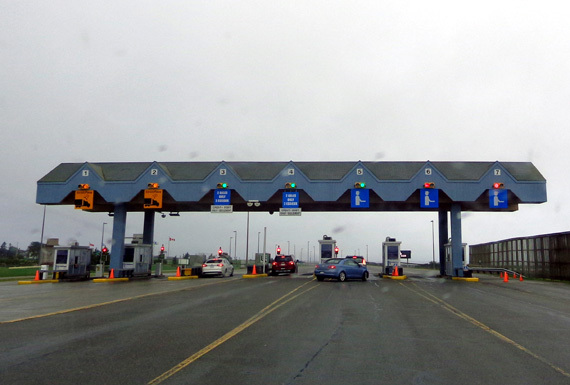 Note that there is a $60 fee for RVs and tow vehicles or toads with a total of four axles on the Confederation Bridge when folks leave PEI (not on entry). The fee is $45 for two-axle vehicles. Traffic wasn't heavy on the bridge today, fortunately. It was raining pretty hard when we crossed. One of the ferries over the strait is down for repairs so more people have been using the bridge the last few days. Traffic was moderately heavy the entire way, possibly because it was the day after a long holiday weekend. Most of the highways were one lane each direction, even limited access roads. 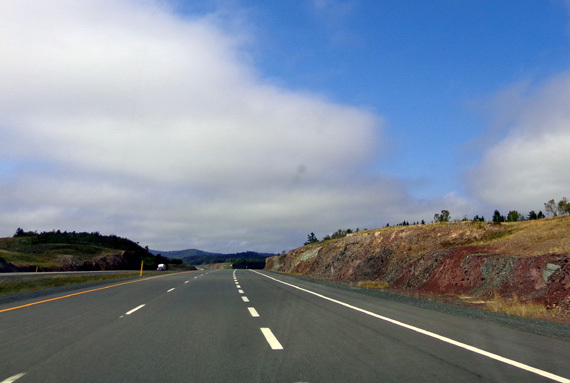 We saw very few rest areas in the Maritimes and they aren't like most of ours in the States; they were either at welcome centers or truck stops. 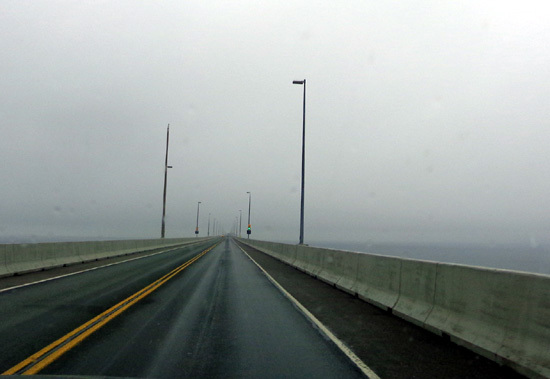 The weather was variable -- overcast and foggy in PEI, rain before and over the Confederation Bridge, fog through much of New Brunswick until after St. John. We were close to the Bay of Fundy, which probably accounted for a lot of the fog. Luckily the fog wasn't so thick that it made driving hazardous. It sure limited the number of photos I took. We finally saw sun before the border. Yay!!! After all the worry and food consumption (produce we thought might get confiscated), the border crossing at St. Stephen/Calais was a breeze. We followed the GPS -- and another large 5th-wheel coach -- through the smaller crossing in Calais rather than the larger, newer one where trucks are directed. 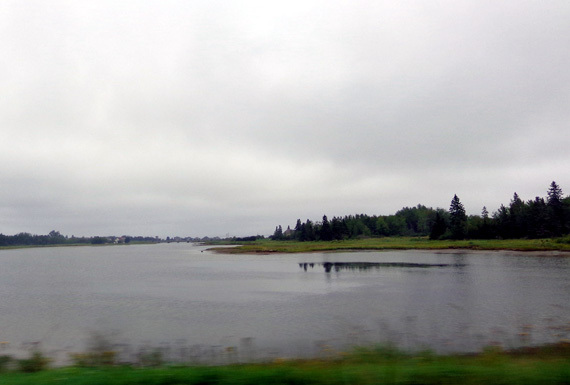 There were no signs telling large RVs to go to the larger crossing west of Calais so we drove through little St. Stephen, NB to the border at the St. Croix River. 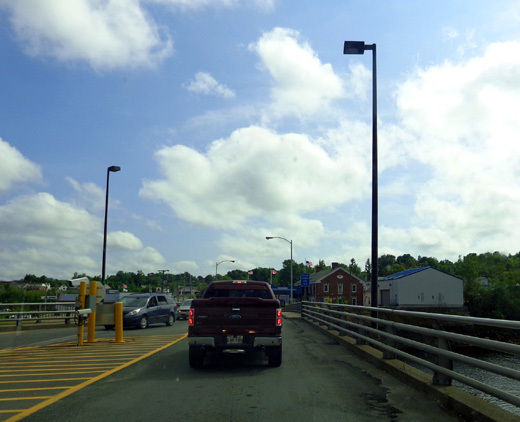 We waited behind about eight other vehicles on the bridge for a few minutes to reach customs on our side of the river. I think they would have had trouble doing a full inspection of our rig. There isn't much room on the U.S. side to pull over and the line would have backed up into the narrow business area of St. Stephen. Too bad we didn't go through that one four weeks ago. It's closer to Walmart, too. Today the cheerful, older U.S. customs agent looked at our passports, ran a very quick computer check, and asked only a few questions (where we went in Canada, when we went there, and where we live). He also asked if we came back with anything we didn't take over with us. I said just a t-shirt we bought and some food. He asked about fresh fruits and veggies, including tomatoes and peppers (none left). We were down to an onion, a bunch of PEI potatoes, some PEI garlic, a mango from Brazil, and refrigerated baby carrots. He wanted to look at the garlic and mango so Jim let him in the camper (no slides out -- the veggies were in a basket in the sink). The agent decided the garlic was OK but took the mango. We came out OK on food. We were also concerned about chicken, cheese, and plants but he didn't ask about those. He also didn't ask about the dogs (who were at the open windows in the truck), vehicle registration or insurance, alcohol, firearms, if or where we work, amount of money we're carrying, or a dozen other things he could have asked about. All that would have been OK. We're just glad he was friendly, efficient, and in a hurry to move the line along. We quickly replaced the mango at Walmart. We spent the night at the same Walmart in Calais -- and in the same spot by some grass and woods -- where we parked overnight before entering Canada almost a month ago. One other RV coming out of Canada parked near us. Jim unhooked the truck for a few minutes and went to get fuel. Diesel was $3.79/gallon, less than in Canada, and the prices for food at Walmart were much better, too. We restocked our produce, dairy and frozen foods, and other items. We won't be as close to another super Walmart in Maine for about a week. I also got a good-sized chrysanthemum loaded with unusual red and yellow flowers for only $3.98. Now that we'll be in the U.S. for the next nine months I can buy a few more plants. Jim noted that about half the license plates he saw in the Walmart parking lot were Canadian. That might partly explain the large number of vehicles going both ways through customs. Canadians probably shop at Walmart and other stores on their way back home from trips to the U.S. and I know some of them drive over here periodically to get gas, food, etc. at cheaper prices. I noticed the two flags flying outside the entrance to the store -- one American, one Canadian. 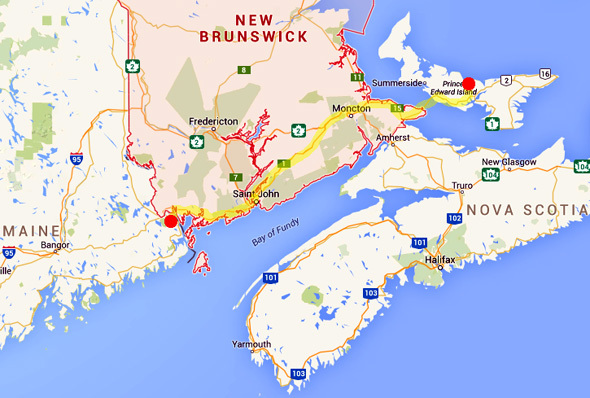 That was common in parts of the Maritimes, too, since so many Americans visit there. Nice touch. We plan to continue following the fall leaves south all the way to Florida. We've never done that before. The leaves are starting to turn in the Maritimes but I didn't get any good photos of them. We'll have to time it right in each area to be there near peak leaf color.